Discover the most highly sought after portrait artists of 2018. With the exhibition for the Sunday Times Watercolour Competition opening soon at Mall Galleries, we thought we’d whet your watercolour whistle by inviting Winsor & Newton Watercolour Specialist, Rebecca Boyd Allen, to take us through her favourite watercolour works on Buy Art. Last week was the Search Press Demo Day, where hundreds of visitors came to watch their favourite artist-authors painting in the gallery. 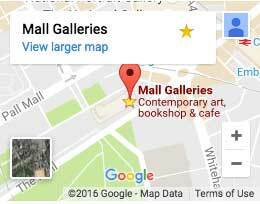 Read on to find out about this and future events at Mall Galleries. Introducing the newest members of the FBA with an exciting selection on Buy Art | Buy Now of these artists' latest work. After twelve years as CEO, Lewis McNaught has decided now is a good time to pass the baton to a new Chief Executive who will lead the charity in its next phase of development. Find out about the presence of yellow in the natural world, mankind's relationship with the colour in the past, and how artists use yellow today to evoke specific moods and emotions, with 'Mellow Yellow', our new selection on Buy Art | Buy Now. A couple on a day-trip to London were walking up the Mall & happened across the Royal Society of Marine Artists’ Annual Exhibition at Mall Galleries. Little did they know that this chance visit would lead to the creation of a stunning marine commission by member artist, Jenny Morgan RSMA. Our new Reception Selection features work by conservationist printmaker, Beatrice Forshall, whose practice in hand-painted drypoint engraving raises awareness about endangered species, and the dangers of animal trafficking and habitat loss around the world. Join us on 27th June at 6:30pm to hear broadcaster, author and art historian Michael Bird explore the work of Wilhelmina Barns-Graham and the St Ives artists - part of The Art of Collecting | Mayfair Art Weekend. Bird will discuss material from his book, 'The St Ives Artists: A Biography of Time and Place'.